Skeetah is a smell before I see him: the oily sweat of dog, pine needles growing green, and an unwashed smell like milk set too long out in a hot kitchen. 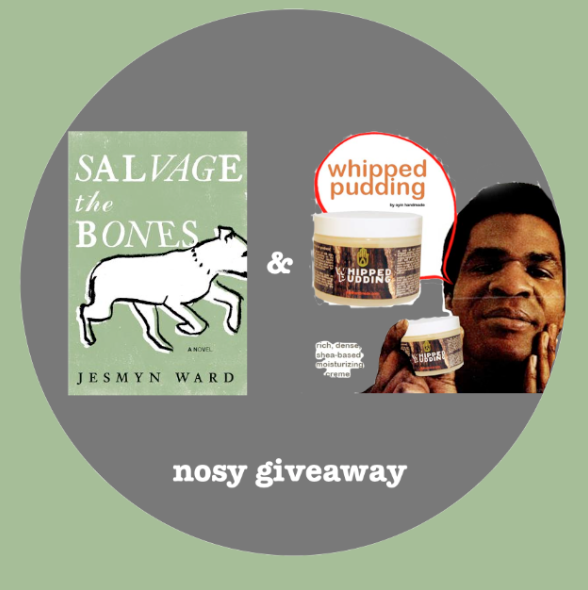 To enter, first share the link to this giveaway on facebook*, twitter, or your blog. If you do not use any of these platforms, I salute you. You can e-mail someone or tell them in person. Next, please leave a comment on this post letting me know how you shared the link (as with last time, honor system reigns around here). I'll announce a winner (selected randomly from the comments) on October 27. Thanks for spreading the nosy word, and good luck to all the great-book-and-scrumptious-smell seekers! *Why not "like" Nosy Girl while you're at it? tweeted! so cool that my friend elizabeth's friend elizabeth (you)'s friend is up for this amazing award.. i feel pretty special & inspired. loving the blog.. yow! If I had a FB, I'd "like" you. I told my boss about your blog and also about Salvage the Bones, which we are going to read and discuss on the train. Posted on my wall. Can't wait to read Salvage the Bones! Shared on fb. Go nose go! Shared on my platform of choice, FB. Shared on Twitter. As another whose nose is important in my life - for good and ill - I'm glad to know about your blog.